I have a love/hate relationship with making sympathy cards... it is awful having to make one, but I always feel better when it's done. It's such a helpless feeling when someone you care about is grieving, and making a card for them isn't a big thing but it is something. I never make them in advance, partly because it feels like I'm pre-empting bad news, and partly because I like to personalise the card to the recipient. For this card, I reached for Healing Hugs. This stamp set is becoming a go-to for all occasions. That rose is just stunning. 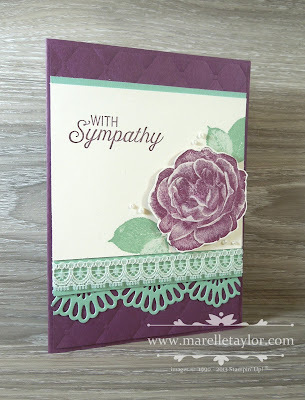 I added a few pretty touches - lace trim, Delicate Lace edgelits, a few pearls and in the background, the Tufted Embossing Folder. I use this 'with sympathy' sentiment (from Flourishing Phrases) ALL the time...hope I don't wear it out! Hopefully this card brought some healing sympathy to its recipient.